Do your characters book hop? Some of them do! The Duke of Villiers has appeared in 9 books—all 6 of the original Desperate Duchesses series as well as the 3 By the Numbers series. He’s still a flamboyant dresser and loves playing Cupid. Talking of Villiers, his son Juby from the DD series renamed himself Thorn, grew up into a shrewd businessman, and fell in love in Three Weeks with Lady X. He’s not the only child from my books to break into his own book. In Seven Minutes in Heaven, Eugenia, the eccentric little girl in Duchess by Night, grows up and encounters Teddy, who appeared as a storytelling youngster in Desperate Duchesses. Another book-hopping pair is Josie and her husband the Earl of Mayne. Mayne first appeared in the Duchess in Love series. Readers loved him so much that I brought him back into the Essex Sisters series, and he finally falls in love in Pleasure for Pleasure. He and his wife Josie are huge reader favorites—so they show up in two novellas as well! One short story can be found in The Essex Sisters Companion, and another (in which you meet their daughter!) is “A Gentleman Never Tells”. In addition, lots of minor characters make appearances here and there. I put all kinds of insider information in the Connected Books section or in the Book Extras section of each book page. 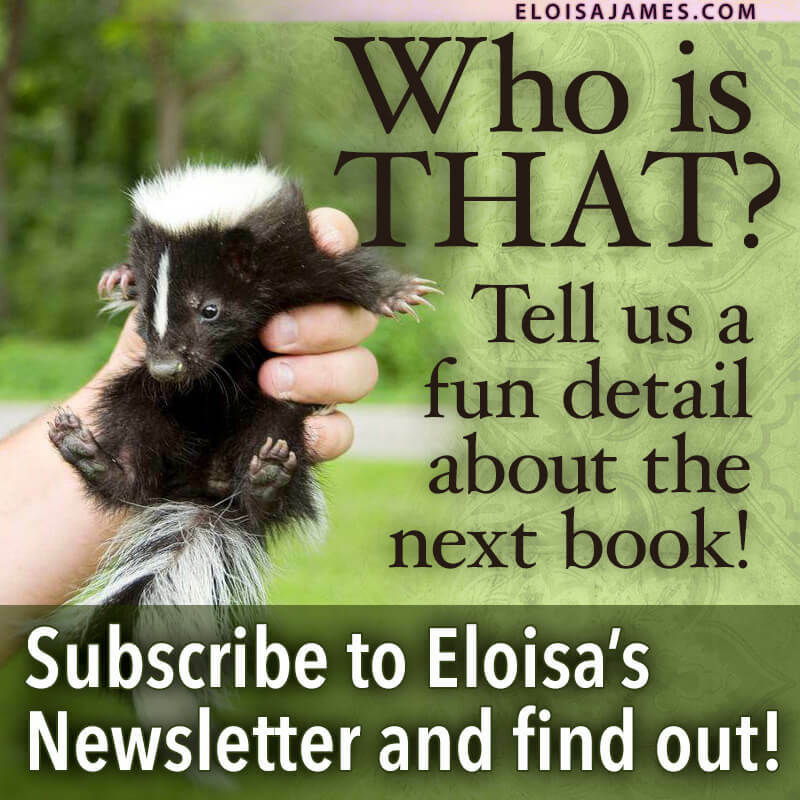 Are you a Julia Quinn reader? Keep an eye out for her characters showing up in the By the Numbers books! (Mine appeared in a few of her books too, as well as a shout-out to pineapples that references My American Duchess). Are you really married to a knight?